If you are interested in 3d printing organs topic you probably heard about Organovo, which currently is a synonymous with bioprinting in the 3D printing world. Just to remind you that they recently announced about their plans to provide 3d printed liver tissue later this year. But Organovo is not the only one who is trying to apply 3d printing technologies in this sphere. 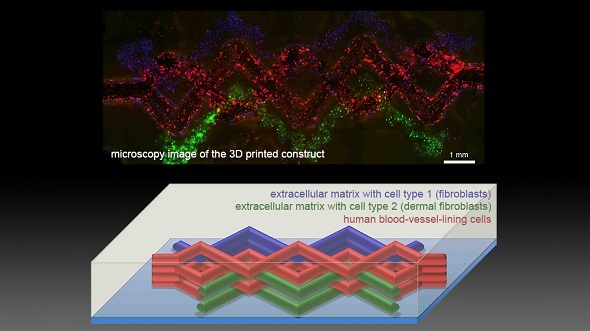 Scientists at the Harvard Wyss Institute for Biologically Inspired Engineering have also announced this week that they have managed to 3d print multiple types of cells and blood vessels, a combination that is necessary to create more complex tissue. On their way to the current stage the Harvard team has faced with some difficulties. For example, it has been difficult to 3D print thick pieces of tissue because the cells on the interior are cut off from the resources they need. 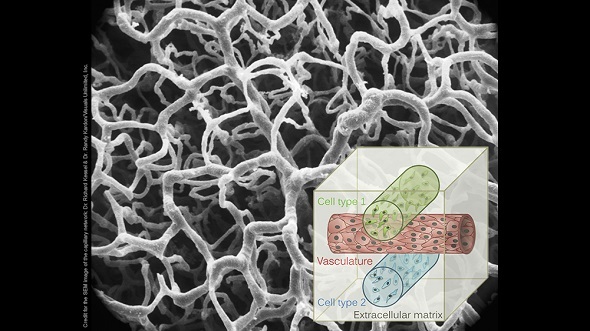 But it was solved by incorporating blood vessels into a mix of living cells and extracellular matrix, which connects cells to form tissue. Also a specific material was used for 3d printing – it melts as it cools in contrast to other materials. It gave a possibility to map out blood vessels within the cells and matrix and only then to cool the finished structure. The cells stayed in place while the other material melted, allowing the researchers to suction it out. The team then filled the newly formed tunnels with another form of cells: endothelial cells, which make up the lining of blood vessels and naturally arranged themselves to form them in the 3D printed structure. The resulting network can feed cells on the interior, keeping them alive. “Tissue engineers have been waiting for a method like this,” Wyss Institute founding director Don Ingber said in a release. “The ability to form functional vascular networks in 3D tissues before they are implanted not only enables thicker tissues to be formed, it also raises the possibility of surgically connecting these networks” to the human body. More details may be found on Wyss website.